The world of GI Joe is a strange place. Not only is there an international terrorist organization the size of a small nation out there whose existence is kept a secret from the general US population, but - even more unbelievably - the daring, highly trained special mission force tasked to combat them actually draws from all branches of the military. Come on, different branches of government cooperating? Other than the Navy carting Marines around like luggage, that never happens! And then, if you want to get really outlandish, no one ever tires to pull rank on anyone else just so their agency can save face! Inconceivable! Flint was a Rhodes Scholar and earned his degree in English Lit. Bored by the Groves of Academe, he enlisted in the Army and applied the tenacity and concentration he had used so well scholastically to grind his way through Airborne School, Ranger School, Special Forces School and finally Flight Warrant Officers School, graduating each with top honors. A thorough tactical planner, Flint drafted and personally led a half dozen rescue missions in hostile territories that for obvious reasons of security were never publicized let alone admitted to. It's interesting to see that Hasbro's dedication to recreating the original Joe experience extends even to the file cards - that's exactly the same bio Flint had back in 1985. The flavor text under it is the same, and they even duplicated the error in his pay grade: it says he's a Staff Sergeant (E-6), when he's specifically identified as a Warrant Officer (usually shown on his other filecards as W-2). Warrant Officers rank higher than the enlisted men, but below the commissioned officers; but Flint has always seemed to be second-in-command behind Duke, who's consistently portrayed as an E-8 Master Sergeant. Confused yet? Maybe they just mean Flint filled the role of a WO on the Joe team without having the actual rank? It's not like rank was ever very important in the series. Befitting his place as Duke's backup, Flint is created using Duke's body. At least, using the same mold. Duke's tan shirt has been replaced by black, and the formerly green pants now have a brown camo pattern on them. The really obsessed fanboys are surely upset that Flint isn't wearing gloves, since his original figure was, but that's a minor complaint to anyone else. The canvas sections of Flint's boots are tan, while the rest is black. 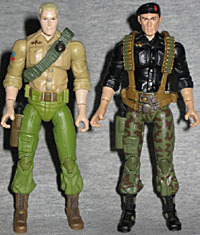 The 1985 Flint figure also had sculpted web gear on his chest, but today it's a separate piece with fully sculpted buckles, bullets and pouches on the sides. Flint's face does seem a little thin in the cheeks - he looks like he's just gotten over the flu or something. Mr. Faireborn, here, was always a fairly robust guy: he's from Wichita, so he needs to have that good, cornfed Midwesterner look about him. He also need to pull that beret down a little bit. And while he's at it, he needs to switch that black beret for a green one: black is Rangers, but Flint is with the Special Forces. Maybe you know them by their more common name? After all, no one's ever sung the Ballad of the Black Berets. Actually, if Hasbro wants to release a variation of Flint in a future series, that beret is just one of the things they could change. 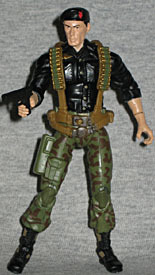 This figure is based on the original toy, but Flint looked pretty different in the cartoon - and since he's the third most frequent character seen on the show (behind only Cobra Commander and Lady Jaye, of all people), that's a very recognizable look. 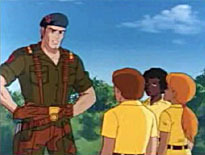 In the cartoon, he wore a dark green shirt and his web gear was reddish brown rather than green; the camouflage on his pants used both these colors, but the pattern was more like wavy stripes than real camo. None of those are huge differences, but they add up to a unique look that Hasbro could exploit. Flint comes with two accessories (three if you count his web gear) and a rectangular display stand. Since his legs are shared with Duke, it just makes sense that he'd have the same black pistol to fit in the holster on his right leg. He also has a green assault shotgun, an updated version of the original figure's weaponry. Of course, the original also had a big green backpack, but this version doesn't get that. He doesn't even get a hole in his back to accommodate a backpack (unless you got a later wave of Series 1, around the time Series 3 started coming out). Flint can hold either gun well, but because of his articulation, he can't really grab the shotgun in both hands very naturally. The GI Joe 25th Anniversary Collection has great articulation, and Flint is no exception. He has balljointed ankles, double knees, balljointed hips, balljointed torso, peg forearms, balljointed elbows, balljointed shoulders and a balljointed neck. The brim of his beret just clears the 4" mark - does that mean we shouldn't refer to these as 3¾" Joes any more? Or is Hasbro just saying that the average member of the Joe Team is pushing 6'5", rather than an even 6'0"? Flint was the toughest character to find in Series 1 of the individually carded TFAC figures, but he's worth it - the guy's a classic! He debuted three years into the line, and damn near took it over. Probably would have, too, if not for the ninjarrific presence of Snake-Eyes. Sure, he's a glorified repaint, and he doesn't have any gloves, but neither of those are reasons to avoid the figure.